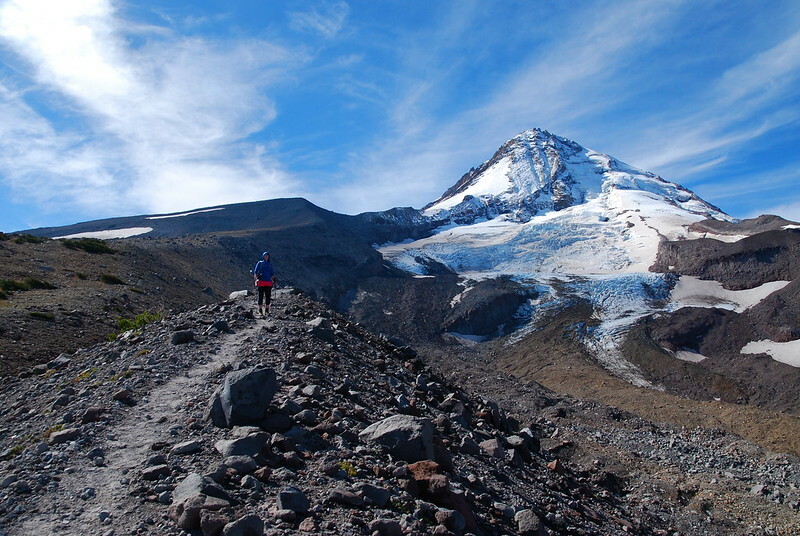 Adventure #28: Cloud Cap to Cooper Spur (Mt Hood) – Hi, Alpine. So. 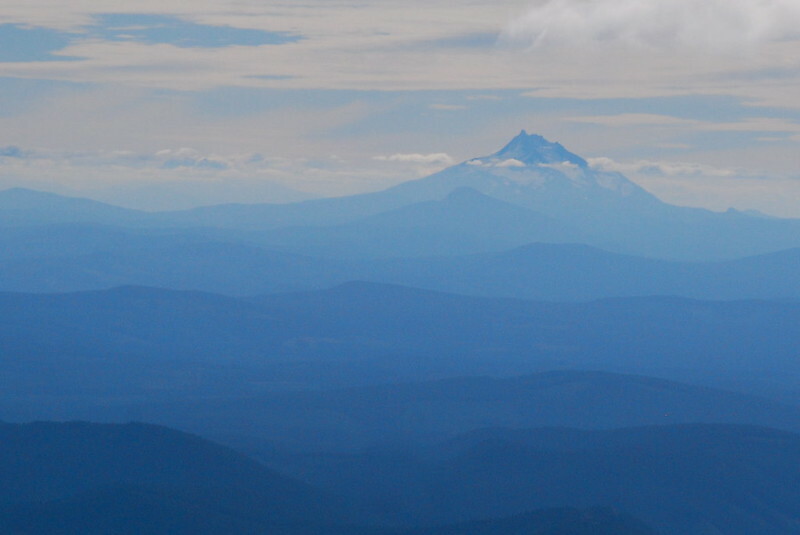 Can we talk about Mount Hood again? I’ve been walking around like a character from Game of Thrones for the last few weeks bitching obliquely about winter coming. But winter’s coming! 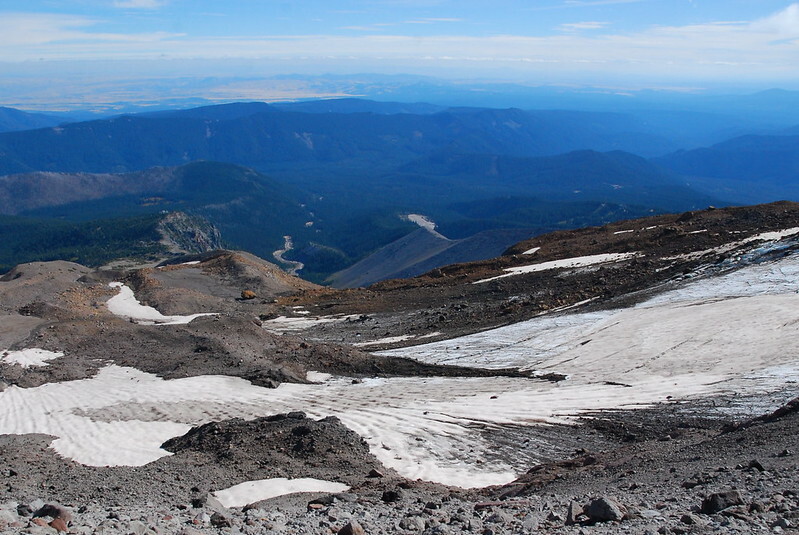 Mount Hood got snow a couple weeks ago down to something like 5000 feet. The all inclusive ski resort theme parks are readying their cash registers. We turned our heat on for the first time today. It’s raining! Pumpkin spice everything is flooding the streets. 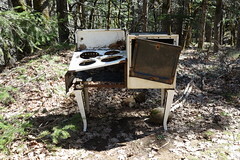 And the summer hiking season’s almost over! 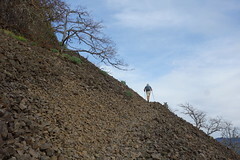 But we still have two hundred hikes to do! My short list of hikes to do is longer than we could get through in three or four years. My long list includes trails that haven’t existed in fifty years, and that probably won’t ever exist again. My wish list would require a time machine and major retroactive changes to patterns of human migration beginning in the 15th century, possibly the 10th if you believe in Leif Erikson. The thing is, the world’s too big and time is too fast. 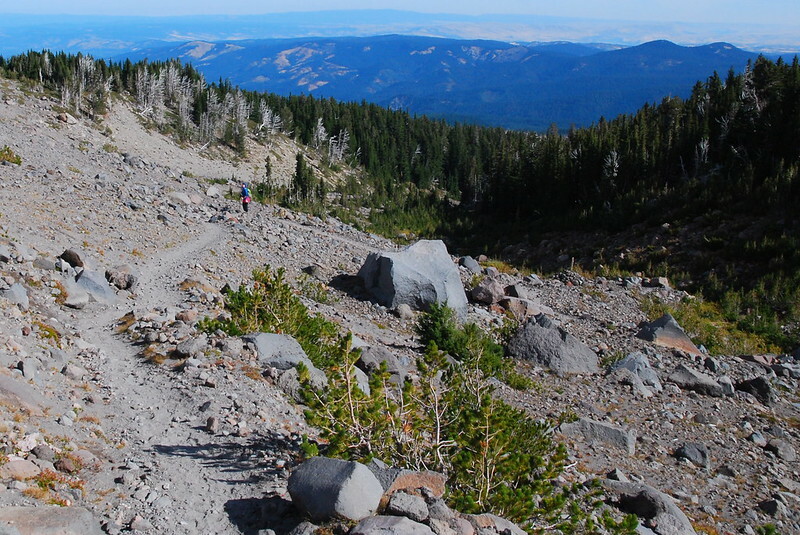 The day before school started again this fall, KRock and I went up to Mount Hood for a hike I’d been talking about since learning that the road to Cloud Cap had reopened: a short, very popular jaunt up to the tip of Cooper Spur (route description here). But then there was the mountain. There’s always the mountain. “It was as if just behind a 7-Eleven store in some innocuous Iowa farm town there was a mist-shrouded 15,000-foot mound on top of which was a book listing the dates of birth and death of every person who will ever live, and no one seemed to notice that the mound was there.” Our first night there, we walked up toward the spur in the fading light. We didn’t have headlamps. I was in jeans and converse, and was exhausted after only a few miles. But there was the mountain. This mysterious mound I’d seen so often from the city, lording like a postcard over southeast. I’d always sort of thought that the whole thing had been ruined – or, at least, domesticated – by ski runs and resort towns. Too much of it has. 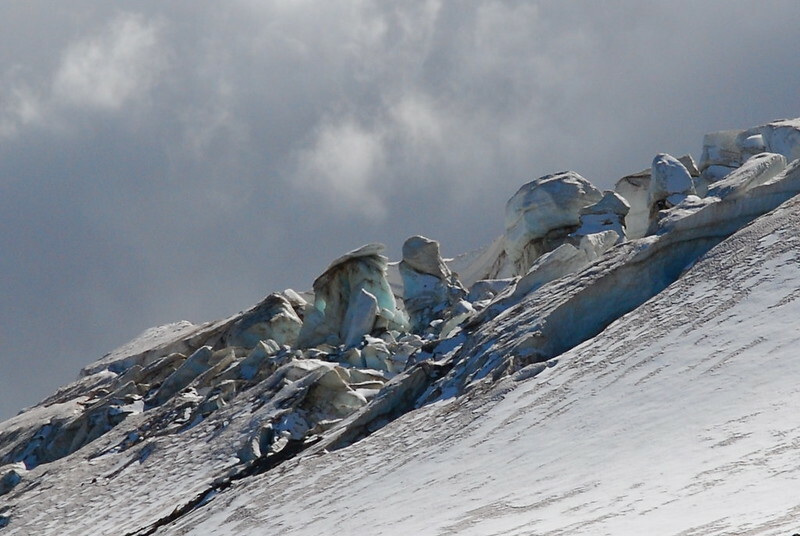 But walking up that night, there was no one above us, just the incomprehensible slope of ice and rock. Flowers I’d never seen before. It was like learning a secret. We’re different now. As we drove up a few weeks ago, the parking lot overflowed with out of town licence plates. Someone from Georgia drove up in a VW Van, like the ones that used to follow the Dead around. 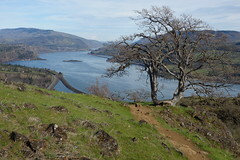 This is probably the third most popular hike on Hood, after Ramona Falls and Paradise Park. We cut through the throngs and started up the short forested stretch before the Cooper Spur turnoff. Years ago, this took us an hour. We were exhausted. “Are we there yet?” This time, it took maybe fifteen minutes. Krista said I was jogging with excitement. 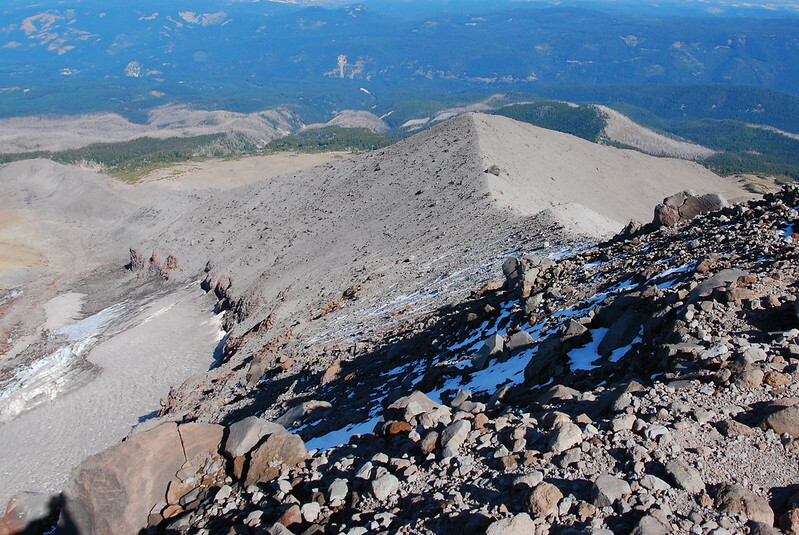 At the Cooper Spur junction, all the Washington volcanoes were out. And this time, we knew their names, had memories of camps and stars on their slopes. 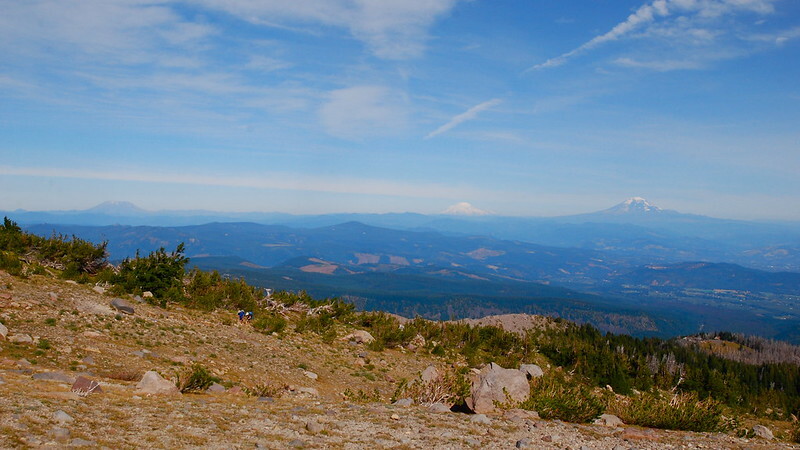 From left to right: St. Helens, Rainier, and Adams. 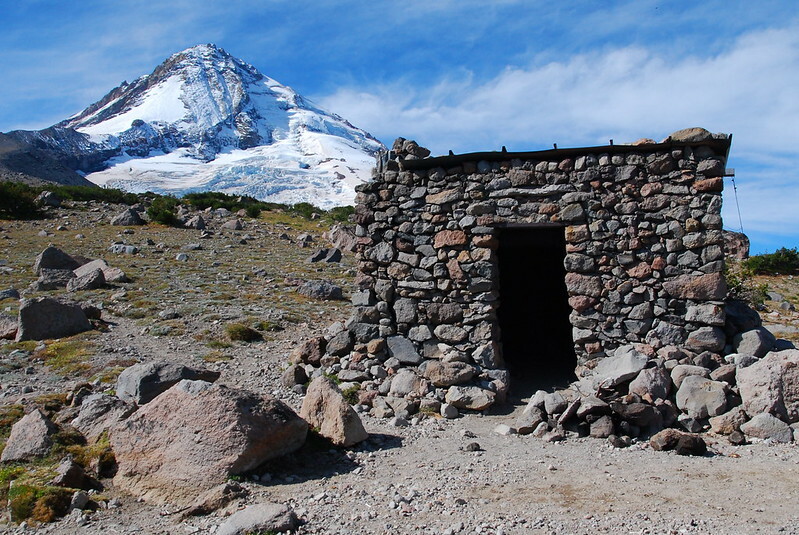 There was no one at the Cooper Spur shelter when we got there, so we sat around for a while, wondering what it would be like to spend a winter night shivering inside. Maybe in a couple months? When did shivering become something I look forward to? We took a quick side trip over to the Eliot Creek washout. 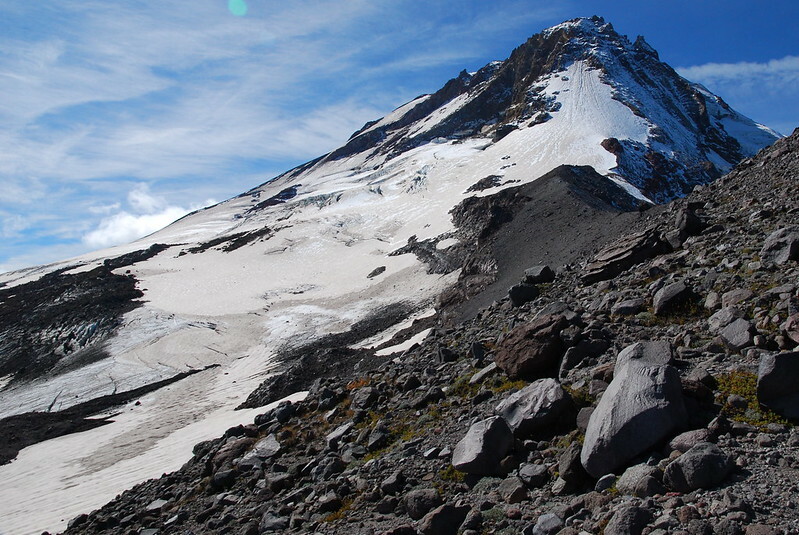 The Timberline Trail around the mountain has been officially closed at this spot for years, making it officially impossible to walk around the mountain without two cars. 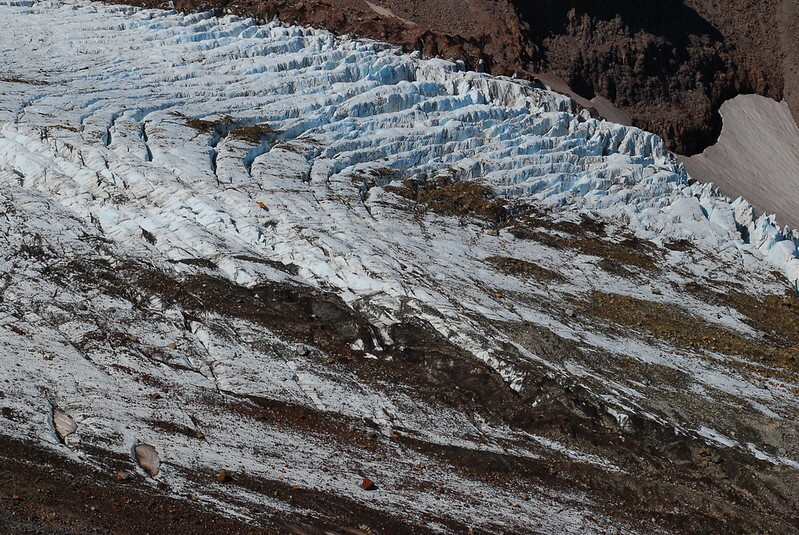 But I ran down the moraine without a lot of trouble, just below where the glacier starts. This is our playground now. 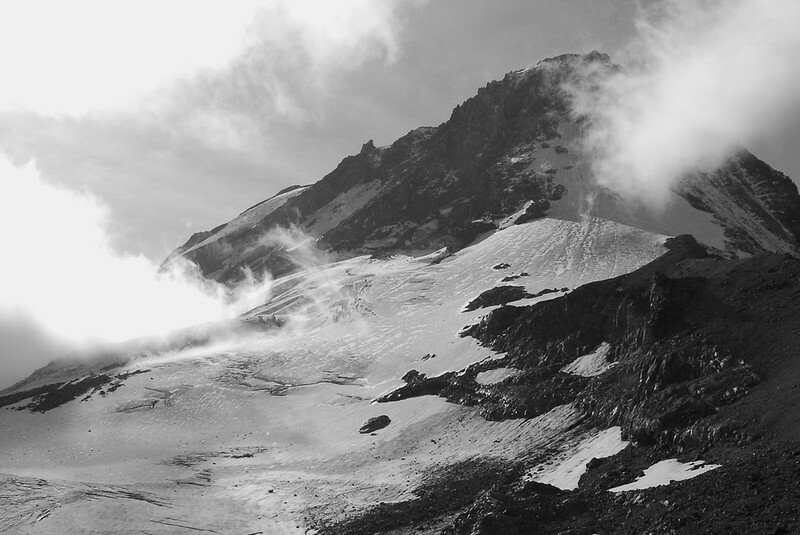 There are a million memorials around Hood: some of climbers, but more than you’d think of pilots who, on foggy nights, flew right into it, mistaking mountain for cloud. There are three on Cooper Spur. The first is for Robert Edling. 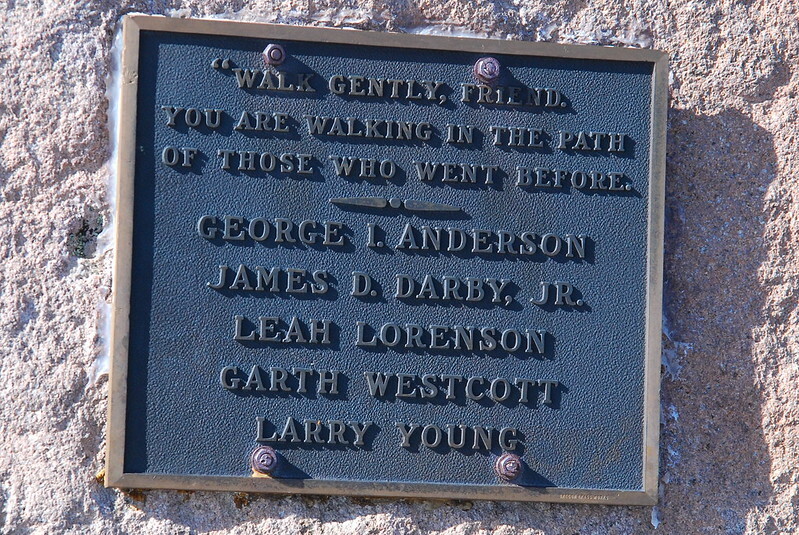 The plaque makes it seem as though he died on the mountain, but he actually died in a crop duster accident near The Dalles, in 1968. 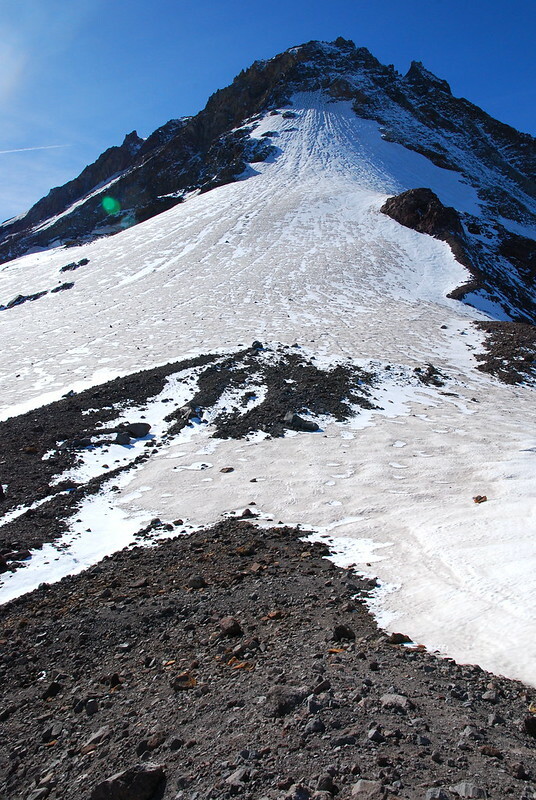 Before that, though, he’d run dozens of missions up to Mount Hood, dropping food or gear for stranded climbers. In 1961, a father and son, Colin and Doug Chisholm, fell 1500 feet down the Eliot icefall, but somehow survived with a couple cuts and broken ribs. 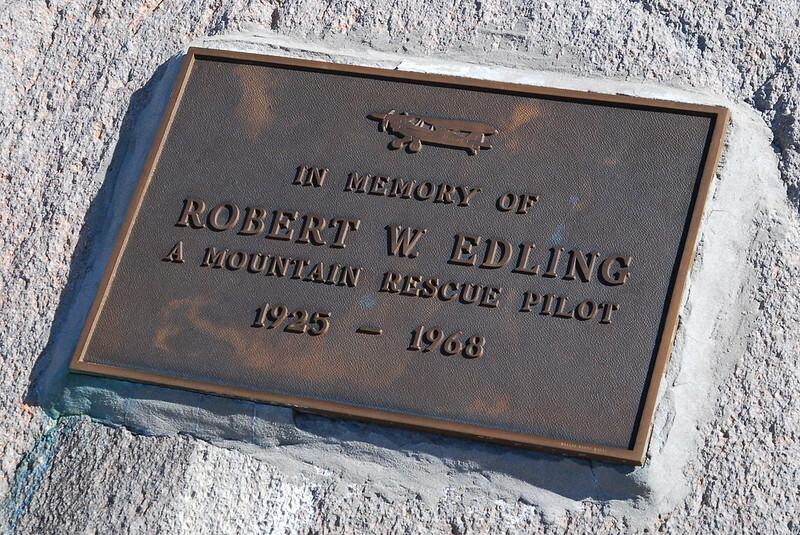 Edling was there a few hours later, dropping sleeping bags and stretchers. His plaque is just up a moraine from that spot. 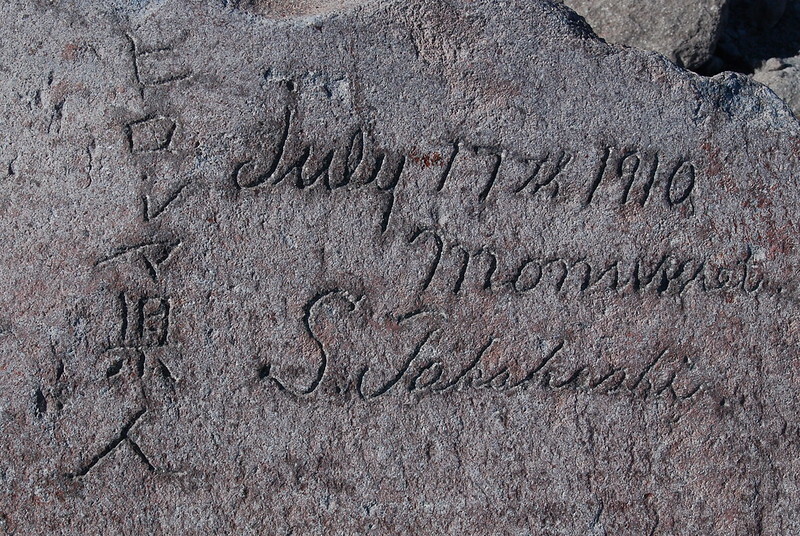 The second memorial, Hiroshima Rock, was left by a Japanese expedition in 1910, with members from Hiroshima and Mie Prefecture. People have been trying for years, but no one’s been able to find details or descendants of the climbers. We walked gently up the spur trail, pausing every few minutes to take more pictures of the Eliot. 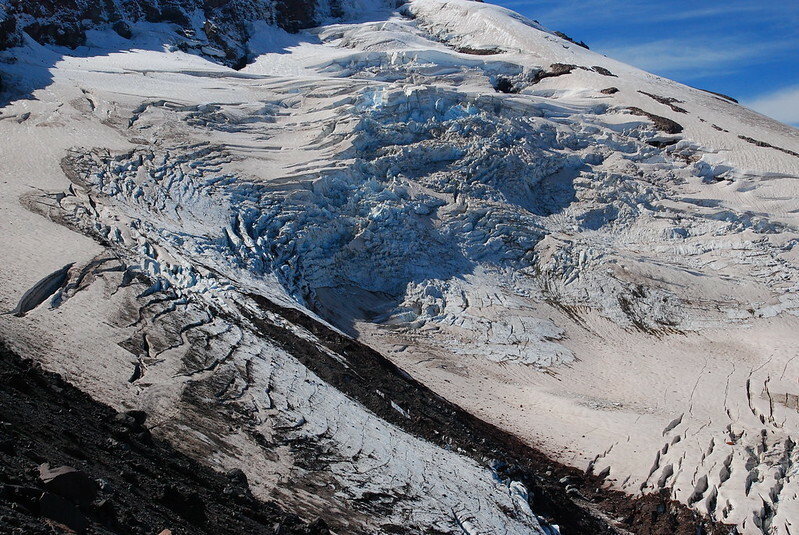 In the last century, the glacier’s retreated nearly a half mile up its canyon. All the ice fall, the crashing sounds we heard all day – it’s a sign of change. 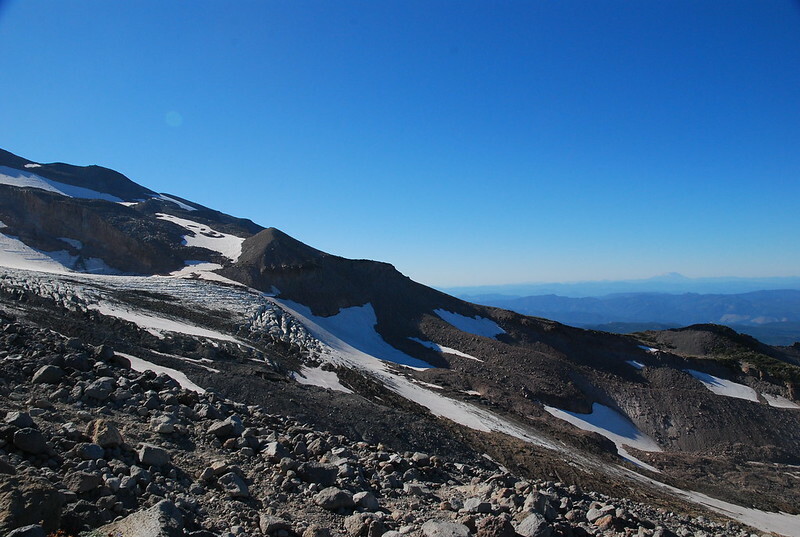 As we crested the ridge, we got our first views across to the Newton Clark Glacier and, further, south to Mount Jefferson. 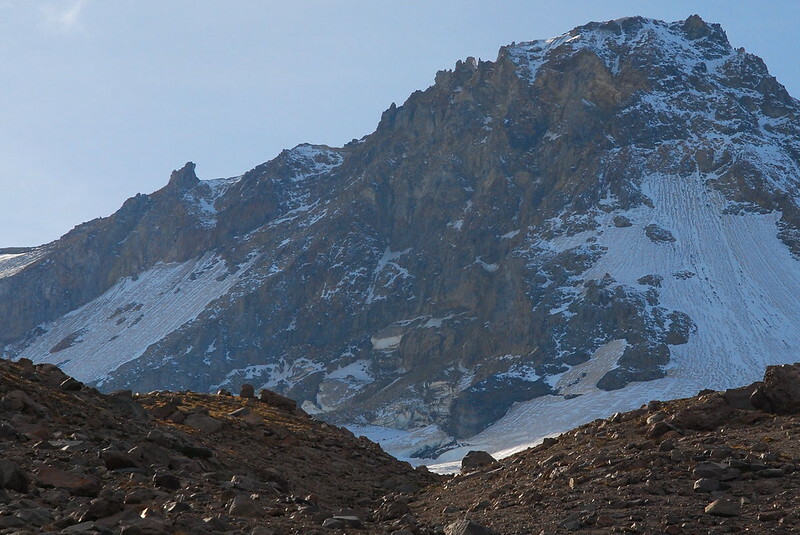 The official route stops at the summit of Cooper Spur, but it’s possible to go a bit further up, to around 9000′, where the Eliot Glacier starts in earnest and further travel would require crevasse and ice / rock fall safety equipment. I (of course) walked until I couldn’t anymore. 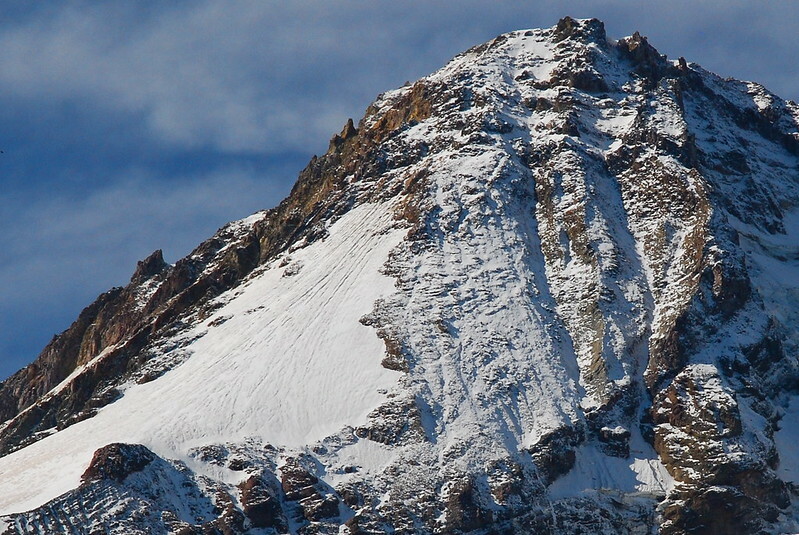 The summit looks so close, doesn’t it? 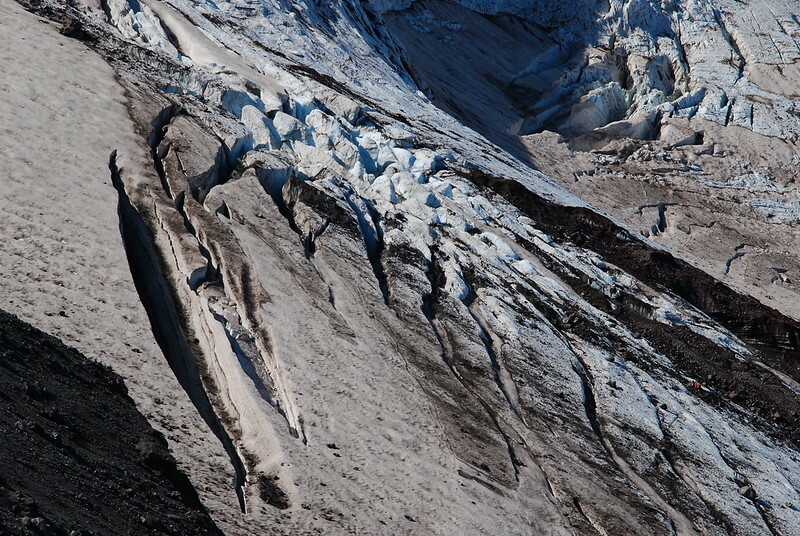 Cool ice formations on the Newton Clark Glacier. View back down to the Spur summit. 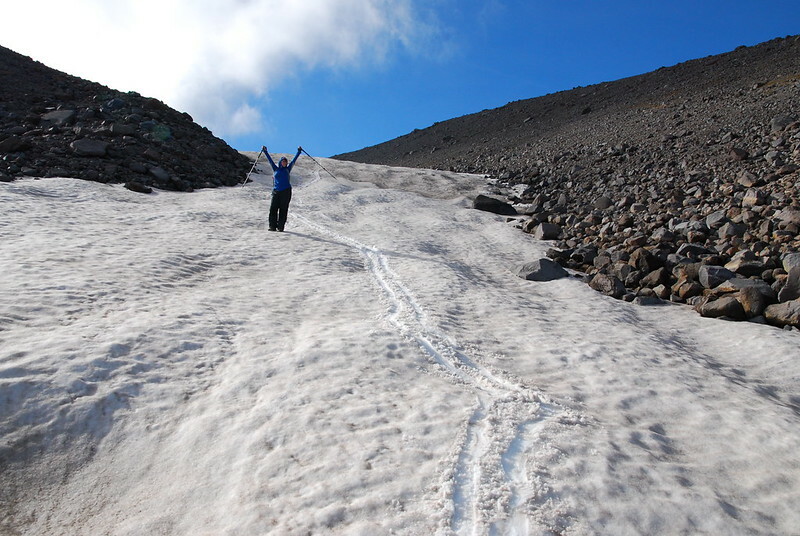 Instead of going back the way we came, we decided to descend steeply down the spur, then boot ski and glissade down the snowfields on the side of the Newton Clark Glacier. As we were happily sliding down, the clouds, which had been predicted much earlier, finally made their way to the mountain. But, just as quickly, we were making our way back home.